This is for anyone who likes to go all out at a festival. If you like to be the center of attention and love to strut your stuff, then take a look at this year's hottest trends. No matter which trend you fancy trying out, the most important thing is to have fun with it. Just remember to respect other people, so you don’t end up appropriating anyone's culture. I know they’re pretty and you don’t mean any harm by it, but ditch the fashion bindi and leave the headdresses alone, there’s plenty of other ways to pull of killer looks. 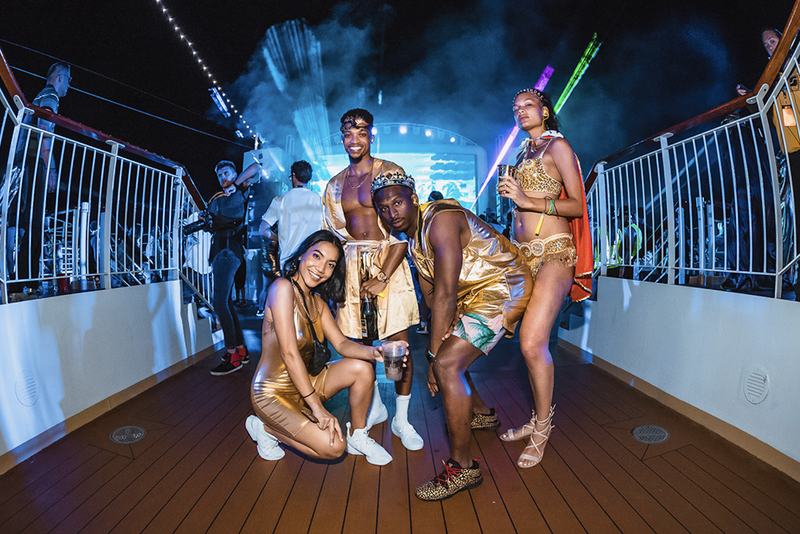 For our top 5 trends for 2019 there’s no such thing as OTT, less is certainly not more, so go crazy and let your personality shine through. Sequins, sequins, sequins. 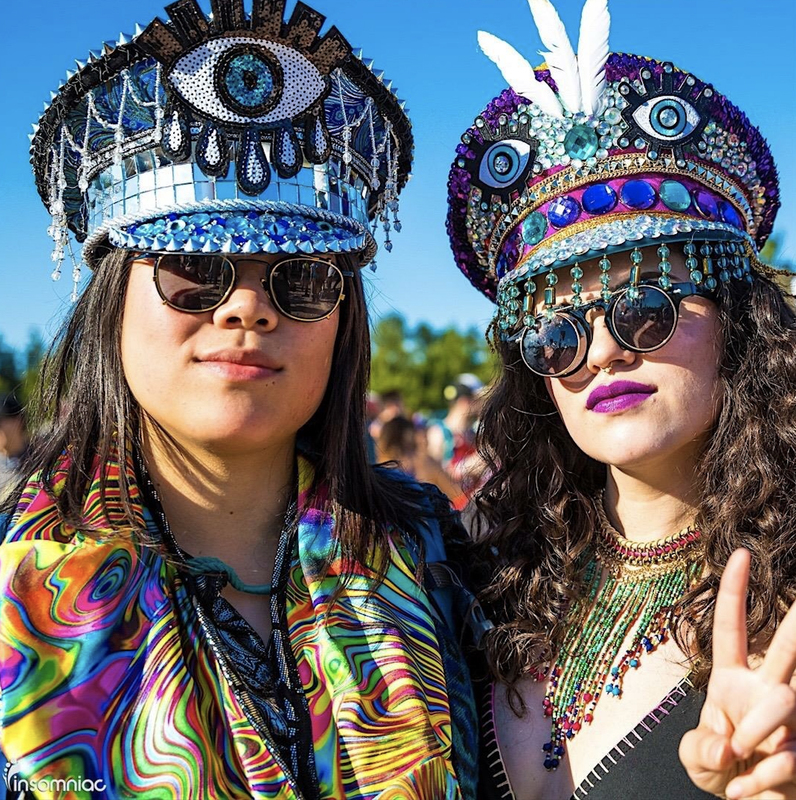 There’s no such thing as too much at a festival, so you can really go all out on the glitz. Sequins never get old and you can easily breathe new life to a drab outfit by adding a little sequin cape. Have a signature sequin piece on hand, or wear them head to toe, with sequins not even the sky’s the limit. It’s official: extravagant hats and headgear are in. I’m not talking about your run of the mill bucket hat or fedora. You need to be in a bejeweled, embellished, over-the-top captain or baker boy hat with all the trimmings. Think sequins, rhinestones, gems, flowers, lace, tassels, ribbons, buttons, you name it put it on! You can buy these from various sites online, but they’re pretty pricey, so for those of us who aren’t made of money, find yourself a hat and wack out your glue gun it’s time to get creative. So swimwear is not just for swimming anymore. 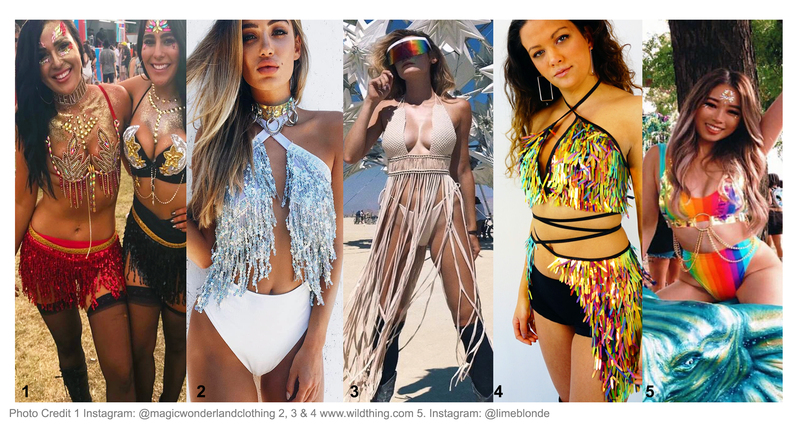 Given the mixing of fabrics and embellishment being used, it’s hard to tell the difference between a bikini and a two-piece, a bodysuit and a swimming costume. But that’s no longer an issue as swimwear is this year’s newest OOTD. You could just use a simple cute bikini, but ideally, you want to create ‘a look’. With the surge in carnival bras the louder and more eccentric the better. Think bright colours, tassels, sequins, flowers, rhinestones, beads, and anything and everything in between. Like I said, there’s no such thing as too much at a festival, so feel free to push those boundaries. 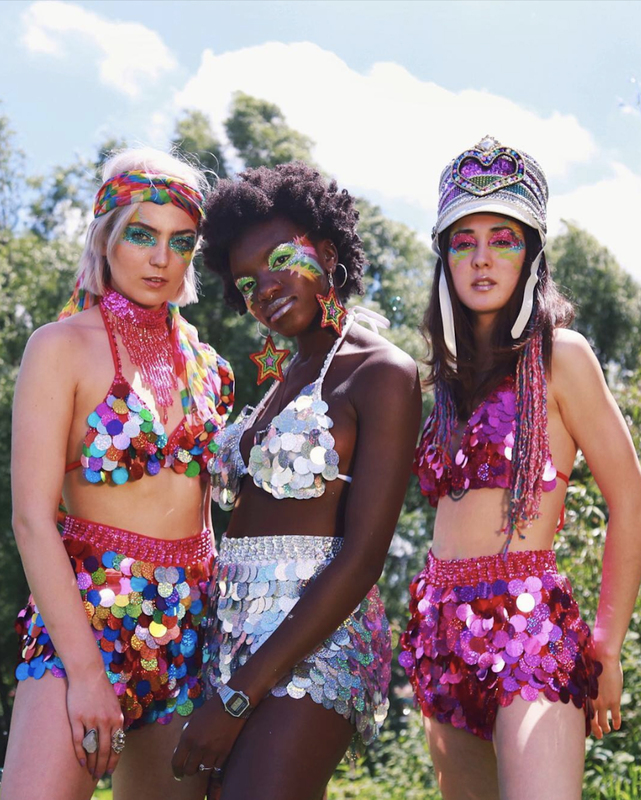 Stand out by adding some holographic or metallic pieces to your look this festival season. The future is now, so don your best futuristic pieces and jump right in. Go all out and rock a holographic bodysuit or a metallic two-piece or simply opt to dazzle with those shiny accessories. 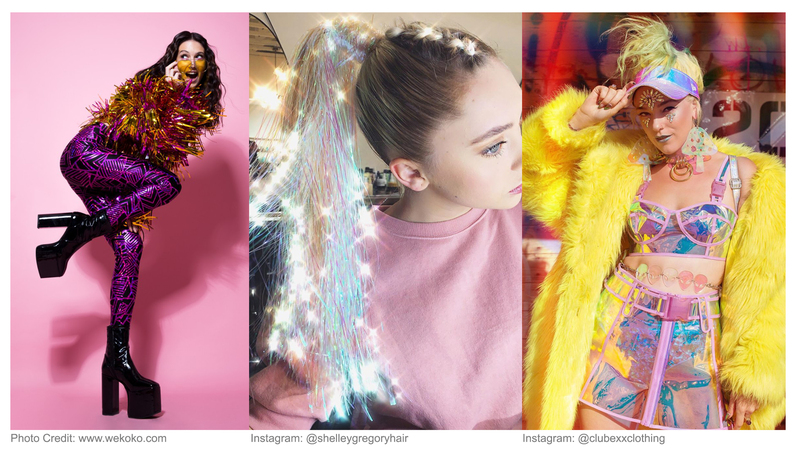 Tinsel is very on trend, so get yourself a jacket made from tinsel or pop some in your ponytail, whatever takes your fancy! 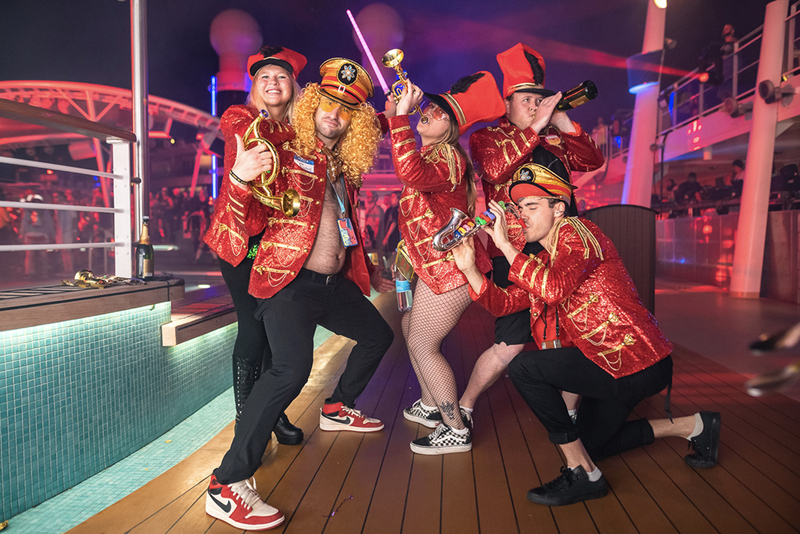 From matching group costumes to comfy themed onesies, all bets are off for this festival season, and fancy dress is the way to go. The great thing about costumes is that you can go as hard as you want. 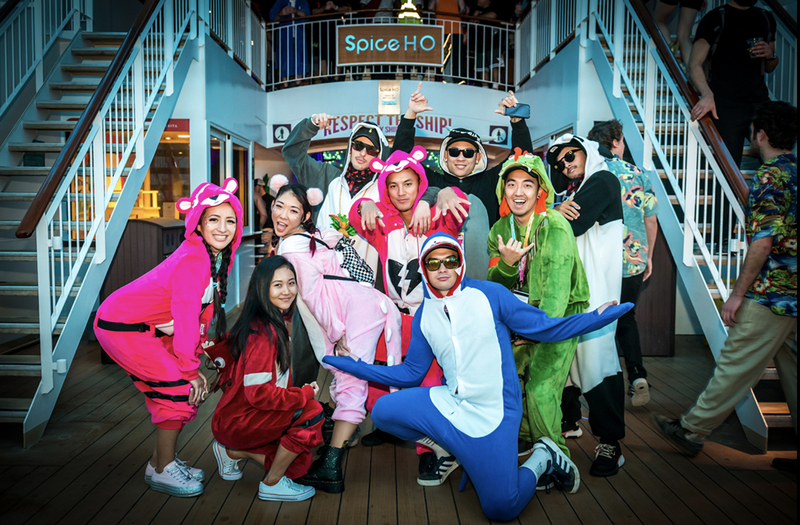 Buy a onesie or premade costume, raid charity shops and see what you can come up with or get creative by customising your clothes, or making your costume from scratch. If you want to do a group costume but you’re stuck for ideas start by seeing what the festival’s theme is this year. If you’re still not feeling inspired start with the basics like your favourite decade, film, tv show or food, other popular choices are things like Disney characters and mythical creatures. Let’s be honest you can’t go wrong with unicorns, mermaids and dragons.